Y'all are going to have to help me out with something. I have seen a lot of really dumb trends and fashion in my day. But this takes the cake. At least hers is on the back of her head, where she can forget how stupid she looks. 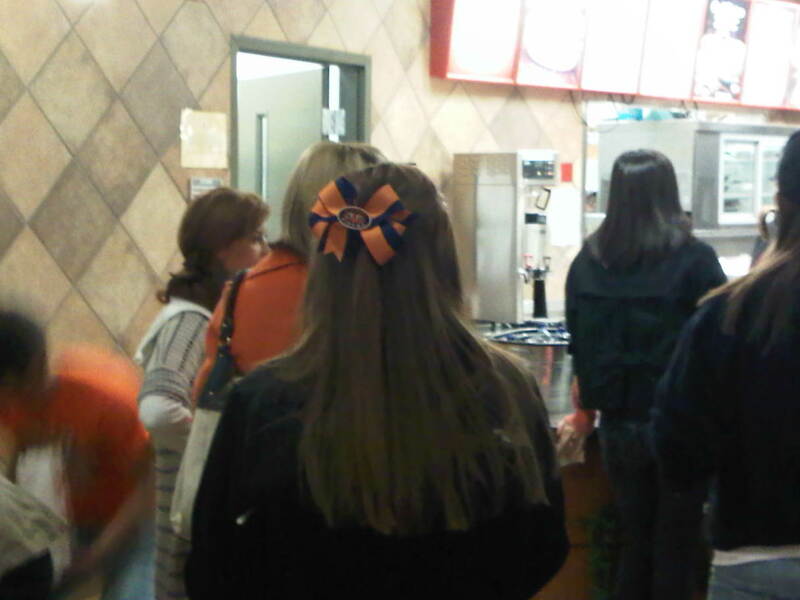 And in case you don't believe me that she's too old to wear a hairbow - she paid with her Tiger Card. Case closed. The Bama girl - whose, by the way, was houndstooth OF COURSE - I saw had hers perched right atop her head. Who should we blame for this? Are they doing this on the Gossip Girl or something? Obviously, since the offending party included both Bama and Auburn fans, this is an equal-opportunity crime that needs to be wiped out completely. Oh this is bad- very bad. I could totally see the elephant girls with these perched up on the bump it hairdo, but the Auburn ones too? I am so not a fan of the baby barrett. HAHA! I laughed out loud at "doodad." I know exactly what you're talking about, I saw at least five. That Auburn one takes the cake though, the ones I saw were much smaller. I DON'T GET IT.